WITH MUSICAL GUESTS EDDIE MONEY, THE MARSHALL TUCKER BAND, FOGHAT & MORE! 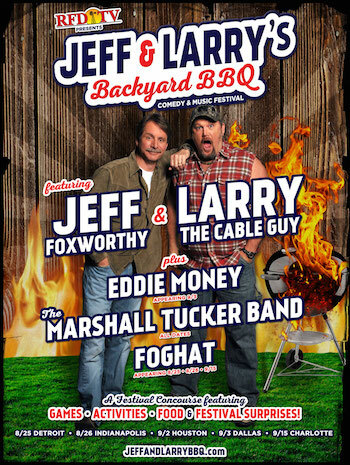 Two of the country's most renowned comedians, Jeff Foxworthy and Larry The Cable Guy, have teamed up to create RFD-TV presents Jeff & Larry's Backyard BBQ Festival — a brand new comedy and music festival coming to multiple cities this summer, promoted exclusively by Live Nation. With a long history of collaboration, the two have toured together multiple times and even share a stand-up special, We've Been Thinking…, which was released this past August and is available on Netflix. Between the two, they have racked up multiple film and TV roles, Grammy nominations, comedy specials, and their own SiriusXM channel (Jeff & Larry's Comedy Roundup). They've also hosted popular television shows, FOX's Are You Smarter Than A 5th Grader? (Jeff Foxworthy) and the History Channel's Only in America with Larry The Cable Guy (Larry The Cable Guy). Jeff Foxworthy says, "Let's be honest. If we didn't have music and laughter we'd all go crazy! We're trying to bring folks a double dose of both in one night. I can't wait to kick this off and keep my sanity in check! See you there!" Larry The Cable Guy adds, "If you don't like this tour, you need your American credentials taken away! This is gonna rock! I'm glad to be a part of such a fun event. I might even get to sing! (Only at sound check)." RFD-TV presents Jeff & Larry's Backyard BBQ Festival will feature the comedy of Jeff Foxworthy and Larry The Cable Guy, along with musical performances by rock acts Eddie Money, The Marshall Tucker Band, Foghat, and more to be announced! Musical acts will vary by city, so check local listings. With a number of Platinum records under his belt, Eddie Money is most well-known for his Top 40 hits, including "Shakin'," "Baby Hold On," "Two Tickets To Paradise," and "Take Me Home Tonight," which was a Grammy-nominated duet with Ronnie Spector. The Marshall Tucker Band has launched its 45th anniversary tour and continues to perform at sold-out shows across North America, having earned five Gold albums and two Platinum albums. Foghat formed in 1971 and has earned eight Gold records, one Platinum record and one Double-Platinum record. Their top 20 hit "Slow Ride" was named the 45th "Best Hard Rock" song of all time by VH1 in 2009. With over six hours of entertainment, Jeff & Larry's Backyard BBQ Festival will be a full day of fun for the whole family. The concourse will feature a full selection of local barbeque options and a number of festival activities including dunk tanks, backyard games, and more. A Citi® cardmember pre-sale begins Tuesday, March 7 at 10:00 a.m. through Friday, March 10 at 10:00 p.m. through Citi's Private Pass® Program. For complete pre-sale details, visit www.citiprivatepass.com. Tickets for the general public go on sale starting Saturday, March 11 at www.livenation.com. Lawn and reserved seating tickets will be available for purchase, along with Family 4-Pack ticketing options on select dates. A full list of on sale dates is listed below. Additional information on tickets and pricing is available at http://www.jeffandlarrybbq.com. A limited number of VIP ticketing packages will also be available for purchase. VIP Fan Packages are $199 and include one premium reserved seating ticket in rows 10 through 20; access to the VIP lane for expedited entry into the venue; a Jeff Foxworthy & Larry The Cable Guy survival kit, filled with a number of surprises; a souvenir VIP concert ticket; and on-site VIP host and ticket pickup. Git-R-Done VIP Meet & Greet Packages are available to those ages 21+ for $399. These include one premium reserved seating ticket in rows 1 through 9; a Meet & Greet and individual photo opportunity with Jeff Foxworthy & Larry The Cable Guy; exclusive access to the VIP Club including a cash bar and dedicated restrooms (where available); one drink ticket per order; one VIP parking space per order (where available); access to the VIP lane for expedited entry into the venue; commemorative VIP laminate and branded lanyard; a Jeff Foxworthy & Larry The Cable Guy survival kit, filled with a number of surprises; a souvenir VIP concert ticket; and on-site VIP host and ticket pickup.